As Mack eased the throttle forward, the 450 horses living in the Pratt and Whitney came awake with a thundering roar that echoed from the surrounding mountains and the Staggerwing started moving. Seconds later the tail came up, but as it did the Beech started a slow but inexorable swing to the left. Mack's view out the windshield of the powerful classic changed from one of smooth, green runway stretching away a half mile in ahead, to a startlingly close up view of the tennis court and the pond located on the west side of the runway. Copious amounts of right rudder, then panic induced pressure on the right brake did little to stop the swing, and it seemed to Mack that Mr. Toad's wild ride was about to be duplicated in an airplane. Mack was a successful businessman who had entered aviation at mid life and embraced it with fervor. I had met him a few years before in the late sixties, when he flew in to our grass field at Buckhannon. Over the intervening years we'd become good friends and I knew that he had a passion for flying and for airplanes. He soon gained an instrument and multiengine rating and had collected several aircraft. When we moved our FBO to Morgantown, Mack became a frequent visitor and I got to hear about his aviation life as it unfolded. He built a beautiful sod runway on a scenic 200 acre mountain top farm that he owned, and then built a large hangar to hold his ever expanding flock of airplanes. As his experience piled up, he bought a new Seneca from our Piper dealership and it took its place beside the other airplanes at his strip. The farm where the airport was located was a working cattle operation where Mack raised Hereford cattle that he sold each year. Of course he also harvested the hay from the farm that fed the cattle through the winter, and next to flying he loved working the farm, taking care of the cattle and operating the many farm machines. Of course the farm and the cattle and the flying were only hobbies. The heavy truck dealership he owned turned a handsome profit and brought in the funds necessary to keep all of this happily functioning. Life was good for Mack. Mack built the airport as a place to keep his growing collection of airplanes, but it was also built as a place to bring his friends. He loved to entertain and if you were a friend of Mack's, you looked forward with great anticipation to his next party, because he was the consummate host. He moved a large mobile home next to the runway; its only function was for use in entertaining. He had a regulation sized tennis court built down by a large pond where his guests could fish. The steaks he served to his friends on the deck at the mobile home were special cuts, measuring two inches thick that could be cut with a fork. Your drink never got below halfway down in your glass before being refreshed by Mack and after a visit to a party at his airport you felt as if you had been on vacation at a resort. One day when he had flown down for a visit he told me over lunch at the terminal, that he had decided to get checked out in tail wheel aircraft and that he planned to purchase one. In those days there was no tail wheel endorsement on one's license and aircraft with the little wheel on the back were referred to as having a 'conventional gear'. In spite of a healthy accumulation of hours in his log, it had all been in tricycle gear aircraft and he wanted to master the mighty tail dragger and become a real pilot. The next time I saw him he was getting dual in a yellow Super Cub that he had purchased. After a few flight hours of touch and goes on our five thousand foot runway, I watched as the instructor climbed out and Mack disappeared over the mountain to the east, on his way home with his new airplane. A few days later I called to ask how he was getting along in the Super Cub. 'Weaver', he said. 'It's all over rated. Tail draggers are a piece of cake'. Uh oh, I thought, and then he laid it on me. He had purchased a Beech Stagerwing. He would pick it up next week and when he got it home he would come over and take me a ride in it. A week passed and I hadn't heard from my friend so I called. When would I get my ride, I asked? 'Weaver' he said, 'I put the Beech in the pond'. He went on to explain that he hadn't put it over by the pond, or put the wing in the pond, but had put the whole airplane perfectly, right in the middle of the pond. It turned out he had lifted the tail a trifle too early, just at that awkward point where the elevators are capable of lifting it, but just before the rudder has the authority to steer, and Mr Torque took Mack for his last Staggerwing ride for a while. Mack wasn't hurt and as it turned out the Beech suffered amazingly little damage. 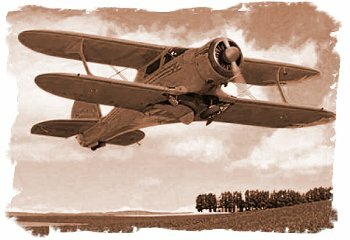 A two year restoration by a craftsman specializing in such aircraft resulted in a beautiful airplane that Mack later spent many enjoyable years flying. A post script about the aftermath of the pond incident however, will live forever in West Virginia aviation lore. After Mack swum ashore, he decided that he needed a drink and a change of clothes, so he went home, leaving the scene of the accident just as it was. It was a short time later when Carl, a good friend who hangared his airplane there arrived. As he drove in it was hard not to notice the large airplane sticking out of the pond. Panic stricken, Carl rushed to the water and saw Mack's cowboy boots floating where he had pulled them off to swim ashore, but no Mack. Hesitating only to pull off his own shoes Carl dove in and started searching the bottom for Mack. An hour later, now with the flashing lights of multiple emergency vehicles adding drama, and divers combing the bottom of the pond for Mack's body, Carl called Mack's house to break the news to Mary, Mack's wife. A now well oiled Mack answered the phone and slurred to Carl that he wasn't dead, but might wish he was.